Our procedure "Rodent Proofing" is often misinterpreted by homeowners whose attics are infested with rodents. Pest control companies and specialty animal removal companies remove rodents from the attic. While it is rare for pest control companies to include the service of sealing the roof openings, it is more common for specialty companies to do so. To effectively eliminate rodent entry, roofing shingles, tile and/or metal roof covering must be removed. 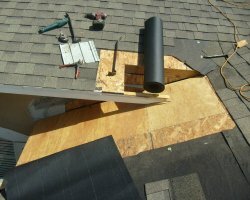 To perform work on a roof, a service provider must be licensed and insured as a roofing contractor. While this is a genuine concern for the homeowners, the lack of knowledge of such a company is typically insufficient to perform the elimination of such problems. The lack of flashing is the most prominent factor regarding our rodent proofing and leak repair procedures. If a rodent can enter your attic, so can wind-driven rain. When summoned for interior water leakage or rotted wood at a soffit to wall, or gable end to hip or valley junction, we include both flashing and galvanized hardware cloth, indicating this point of potential entry has been fully secured from both intrusions. When report of only rodent entry the potential point of entry is eliminated only with galvanized hardware cloth. We have seen points of rodent entry so large a small man could enter the attic, often we can reach our arm into the point of entry. Rodent entry elimination: We see many attempts by handymen, pest control companies, and rodent extraction companies that do not include the removal of any roofing material. Often the prevention includes the emptying of a can of foam into the void. Without the removal of roofing material, there is no assurance that rodent entry will be eliminated. When we encounter these substandard attempts, we must first remove the previous application. When this includes foam, the extraction of the foam takes longer than the application of our wire prevention product. Rodent elimination by those who are not insured exposes you, the homeowner, to unnecessary liabilities. It is in your best interest to request proof of insurance for worker's compensation and public liability before work begins on your roof. It's doubtful that you will find these companies or individuals carry such insurance. Those who do not often work in this environment typically cannot afford expensive roofing insurance.